AppRaisin is a mobile-first service solving the biggest problem in modern app stores - app discovery. 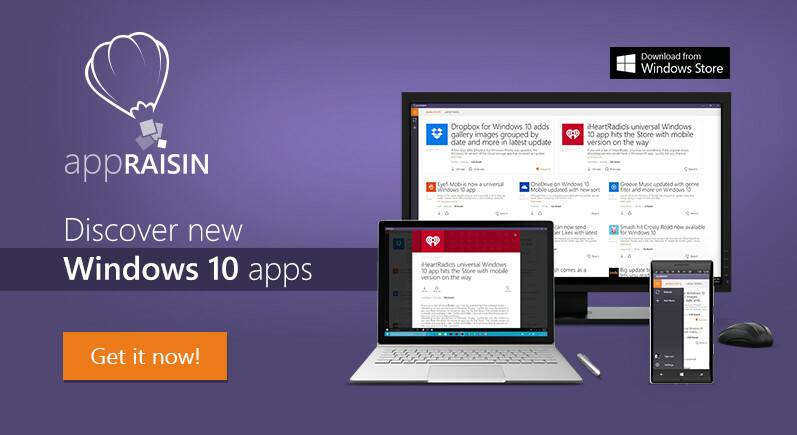 AppRaisin helps Windows enthusiasts keep up with the latest releases, major updates and special offerings, while at the same time, helping independent developers get much needed exposure to potential customers. Most of the web content is monetized with ads these days. In-app ads are the first or second (depending on a platform) monetization method for app developers. Yet, most of the indie app and game developers are easily lost in the sea of terms and 3-letter acronyms used in the advertising industry. In this book we'll try to answer the question why, despite the fact most people dislike ads, you should definitely consider advertising as a monetization model for your mobile app or game. From now on AdDuplex is serving interstitial ads to get even better results while cross-promoting your Windows Phone apps and especially games. Interstitial ads are almost full screen ads that appear during transitions between levels, stages of game, game sessions etc. In this way your ad attracts even more attention and helps you to get more users.